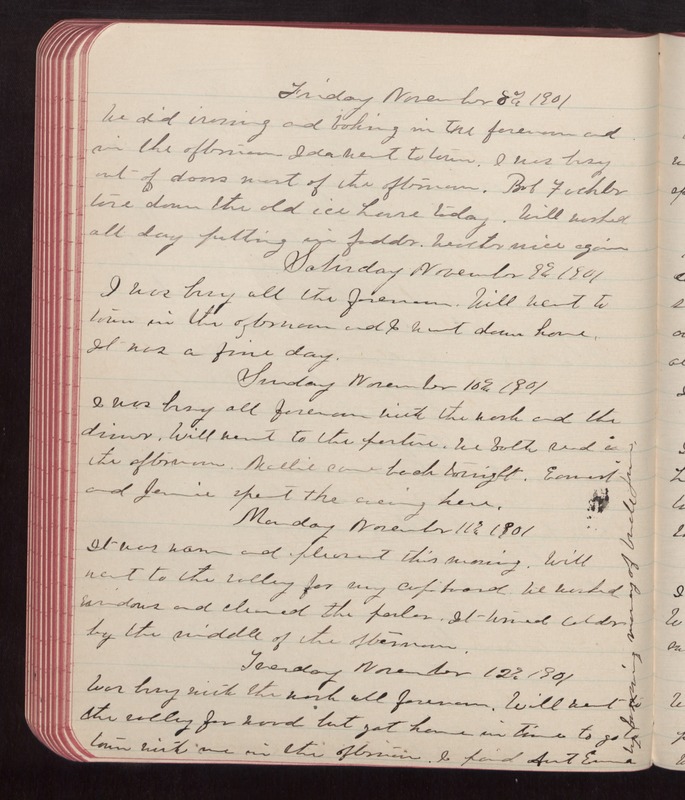 Friday November 8th 1901 We did ironing and baking in the forenoon and in the afternoon Ida went to town. I was busy out of doors most of the afternoon. Bob Fuchor tore down the old ice house today. Will worked all day putting in fodder. weather nice again. Saturday November 9th 1901 I was busy all the forenoon. Will went to town in the afternoon and I went down home. It was a fine day. Sunday November 10th 1901 I was busy all forenoon with the work and the dinner. Will went to the pasture. We both read in the afternoon. Mollie came back tonight. Earnest and Jennie is spent the evening here. Monday November 11th 1901 It was warm and pleasant this morning. Will went to the valley for my cupboard. We washed windows and cleaned the parlor. It tired colder by the middle of the afternoon. Tuesday November 12th 1901 Was busy with the work all forenoon. Will went to the valley for wood but got home in time to go to town with me in the afternoon. I paid Aunt Emma by borrowing money of Uncle Jim.